Another holiday is coming around the corner but we are giving you almost a month heads up on what to get, so no excuses! 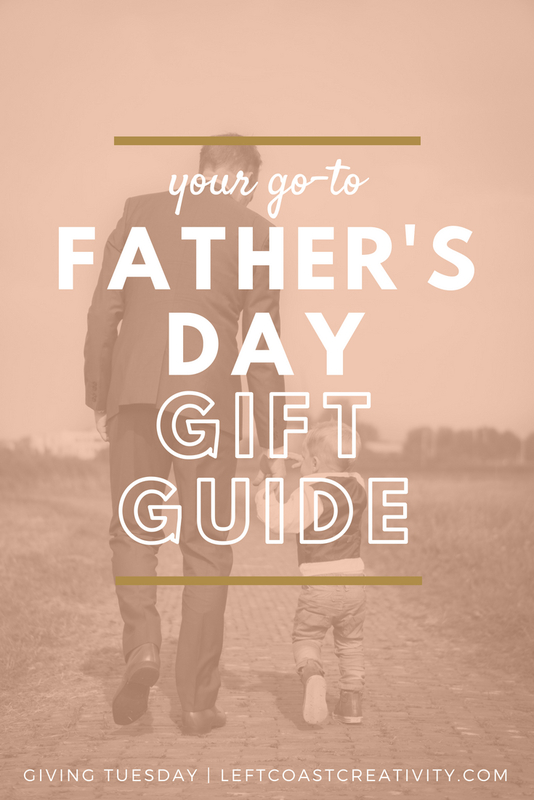 We've taken the guesswork out of one of THE most challenging things to do in this life...finding a gift for the dad or father-figure in your life. Well, things just got a lot simpler. You're welcome. Show our dads some love with gifts that they'll not only appreciate, but like all of our collections, we can feel good about knowing these companies are socially responsible in their own ways. Below I think you'll find that there's something in here for every type of dad, but ultimately, I'll let you be the judge of that. Scroll down below and check out the goods. The name BOMBAS is derived from the latin word for bumblebee and their mantra is my favorite: “bee better”. And you’ll find it knit into every pair of their socks - spoiler alert! These are truly the gift that keeps on giving so treat your dad or father figure in your life to a sweet pair (or pack) of some sweet socks! How they give back: Because socks are the #1 most requested item at homeless shelters, Bombas aims to solve this problem. With over 8.6 million socks already donated, Bombas operates on a one-for-one business model where they donate 1 pair of socks to the homeless for every pair purchased. And the socks they do donate are specially engineered for those who don’t have the luxury of a fresh pair of socks every day. Bombas has over 1,200 giving partners across the U.S. that are a variety of shelters, nonprofits, and other organizations dedicated to serving the homeless. This gift is perfect for the humorous dad-joke lover or the dad who doesn’t want to retire and hopes to always keep it fresh. Nixon Inc. makes a variety of watches for men and women but we’re focusing on the men’s watches for this post. They’ve got looks from sporty to classy to suit the taste of any watch-loving dad out there. How they give back: Nixon Inc. follows a very strict supplier code of conduct that they pride themselves in upholding. This socially responsible conduct covers key areas ranging from child labor, health and safety, discrimination, working hours and management systems and more. They ensure that their entire supply chain obeys these codes of conduct and remain socially responsible in multiple aspects. This gift is perfect for dads who love their accessories or who just want look sharp telling time. With Pela, you’ll find a company who’s passionate for the environment and for providing quality phone cases for every iPhone or Android phone out there. How they give back: Pela has established some clear goals on how they are striving to become an eco-friendly company. Some of those goals are: reducing their plastic waste, educate people on sustainable alternatives, and alleviate the dependency on non-renewable resources. They’re also a member of the 1% for the Planet organization which means they will donate 1% of all their sales to environmental nonprofit groups too! This gift is perfect for the eco-loving father who is socially conscious but also wants to be trendy. The mission at Your Own Maps is simple: to help everyone relive their experiences and to display it in a unique way. How they give back: You may remember this name from our Mother’s Day Collection blog post earlier this month when we shared a similar gift idea from The Night Sky. As humans, we cherish our experiences and to be able to commemorate a special experience in a city such as where your dad met the love of his life, or where the family shared the best vacation, these are a perfect way to show how much those experiences mean to you and also to remind him how important those experiences were. This gift is perfect for the avid traveler who loves adventure and to share experiences with his loved ones. At PIKTO, there are soft and hardcover photobook albums that are more like a visual sharing journal to share memories and ideas in a beautiful way. They’re made out of high quality, soft paper intended to be kept safe, loved and treasured for the years to come. Price Range: Starting at $9.95 (plus adding pages) and other photobooks start at $20, $40 and $85 for premium. How they give back: PIKTO believes in making sure their manufacturing processes and materials are sustainable and environmentally friendly, but they want to reduce waste in providing a long lasting product that can be shared and cherished for an entire lifetime! This gift is perfect for the dads who are the “chief memory maker” or crier in the family. He’ll love this gift chalk full of memories to hold on to for years to come.